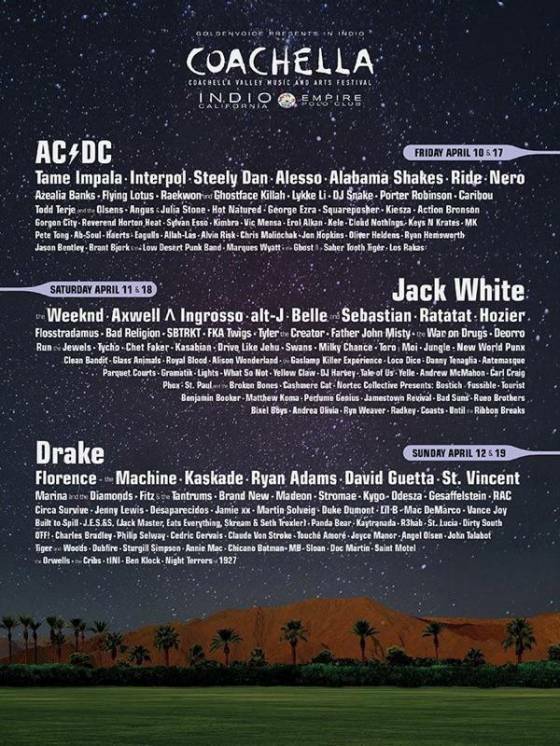 It was just about a year ago that I wrote about the 2014 lineup for Coachella. When I originally saw that lineup, the one featuring headliners like Muse, Arcade Fire, and OutKast, I immediately thought that it would be impossible for any festival to top it in terms of appeal to me. I mean, I would be at all three of these shows without question if I were able to be in the Californian desert in April. That did not happen. I instead attended the Governor’s Ball. This was an amazing choice. Yes, I know every single word to both of these songs. I would give anything to attend this festival. The rest of the lineup looks amazing. Flying Lotus, Raekwon, the Weeknd, Run the Jewels, etc. It’s amazing. But this combo of The Dan and Drizzy is flawless. I mean, swap Kanye West for AC/DC and Childish Gambino for Jack White and I will pay nine figures for tickets.